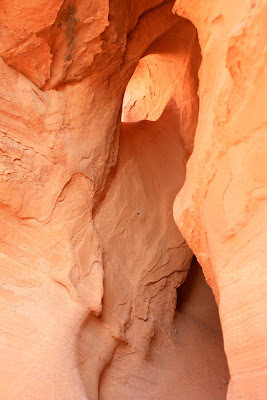 From December through April one of the best places to hike is on one of the many trails of the Red Cliffs Desert Reserve. Because of its low elevation the temperatures are typically ideal and on sunny days sunscreen can be necessary. Along with prime weather conditions the winter is a great time to see many of the raptor species that migrate south during the winter. The section of the Red Cliffs Desert Reserve just south of Leeds, is one of best places to, as the saying goes, get bang for your buck. What you will find along Arch trail is amazing examples of weathering, erosion, the Virgin River, and if you are willing to do a little exploring ample opportunities for contemplation and solitude. Drive 3 miles south down Babylon Road to the Sand Cove parking area. The Sand Cove Parking area is the second major parking area along Babylon Road. Be advised that Babylon Road is sandy in places and a high clearance vehicle is suggested but not required. Driving past the Sand Cove parking area is a little more sketchy. The main attraction for most is the large free standing arch through which the trail passes and many hike to the arch and turn around. That is a shame as there is much more to see near. Don't be afraid to get off the trail in places, be careful of the crypto bionic soil by staying on the sandstone, and explore the area. To be found are some very eye pleasing examples of weathering and erosion. The soft sandstone has been eroded to form many different land formations including pinnacles, red rock hoodoos and arches. Just past the arch there is also access to the Virgin River. 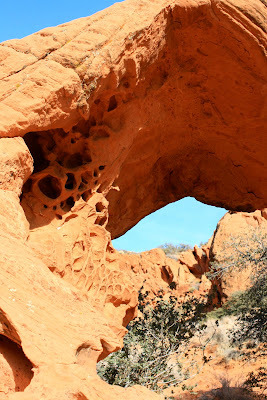 The four mile Arch trail is an easy hike that the whole family can enjoy in anywhere from two hours to an all day adventure, and is ranked as moderate to moderately strenuous, only because of a large sandhill just prior to arriving at the arch. Other than that it there is relatively little elevation change. There are a few places where the youngsters may need a hand to climb up and down the slickrock, but in general they should be able to hike the majority of the trail on their own. One word of caution even though there are several signs it is somewhat easy to get a little turned around so make sure you make a good mental map and often gather your bearings. I feel like a just read a great report on a fun family hike. Thanks for the info on the weathering and erosion - it is great stuff! My family will have to try this one out. My favorite picture was definitely the red rock reflected in the small pool of water - AMAZING photo! Thanks for letting me enjoy the picts! Excellent trail description! The photos are spectacular. One minor flaw... "Cryptobiotic" soil, not "Crypto Bionic". But thanks for telling people to stay off of it, or at least tread lightly. Mountain bikes cut some terrible ruts in it that take forever to heal, leading to more erosion.